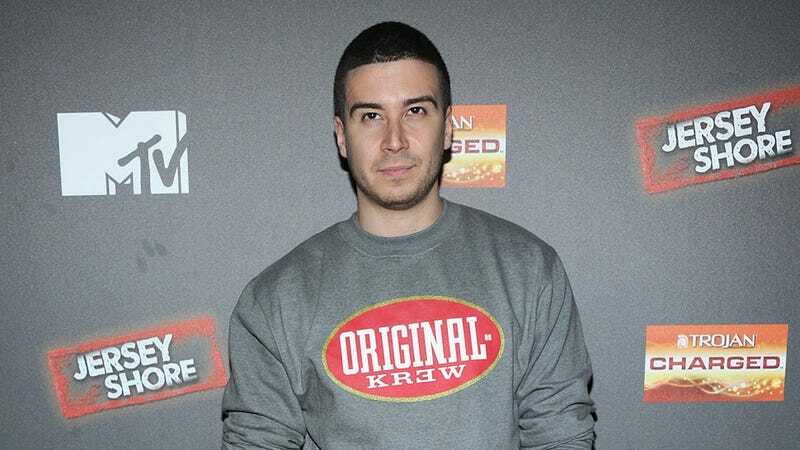 Vinny Guadagnino, the one who literally pales in comparison to everyone else on Jersey Shore, has landed his very own Jersey Shore spinoff. In a press release, MTV announced today that it's given the greenlight to The Show with Vinny, "a hybrid talk show/reality series." The format of the show is that Vinny will interview "the biggest celebrities" in his mother's Staten Island home, over a meal that she has prepared, while other family members like his Uncle Nino sit around the table and interject. The network says, "Celebrities will let their guard down to have a meal and a candid conversation about whatever comes up complete with lots of commentary from Vinny's peanut gallery of loved ones." While they promise "big friggin' stars," they don't give specifics about who is expecte to appear on the show. The show, which wasn't given a premiere date, will be produced by Jersey Shore creator SallyAnn Salsano and will undoubtedly be really helpful for all those people who occasionally suffer from anxiety and have to go home for three or four days and eat a lot of Italian food.